Over the next four years, it became an alliance of domestic violence shelter programs and statewide groups and coalitions against domestic and sexual violence across the country. 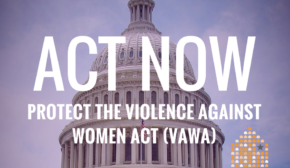 In 1994, it led efforts to pass the landmark Violence Against Women Act (VAWA), authored by then-Senator Joe Biden. The historic law was the first federal legislation to strengthen the government’s response to crimes perpetrated against victims of domestic violence, sexual assault, dating violence and stalking. In 1995, shortly after the passage of VAWA, this groundbreaking organization became the National Network to End Domestic Violence, an innovative group that served as the leading voice for domestic violence victims and their allies. Today, NNEDV provides training and assistance to the statewide and territorial coalitions against domestic violence. It also furthers public awareness of domestic violence and changes beliefs that condone intimate partner violence. Promoting federal legislation that effectively holds perpetrators accountable and strengthens services for survivors and their children.